A survey is an empirical research strategy for the collection of information from heterogeneous sources. In this way, survey results often exhibit a high degree of external validity. It is complementary to other empirical research strategies such as controlled experiments, which usually have their strengths in the high internal validity of the findings. 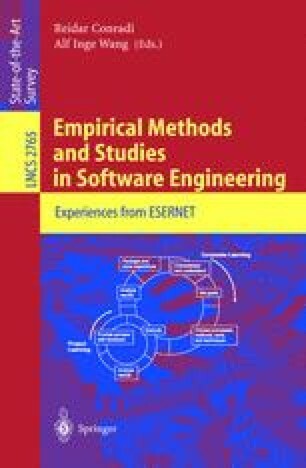 While there is a growing number of (quasi-)controlled experiments reported in the software engineering literature, few results of large scale surveys have been reported there. Hence, there is still a lack of knowledge on how to use surveys in a systematic manner for software engineering empirical research. This chapter introduces a process for preparing, conducting, and analyzing a software engineering survey. The focus of the work is on questionnaire-based surveys rather than literature surveys. The survey process is driven by practical experiences from two large-scale efforts in the review and inspection area. There are two main results from this work. First, the process itself allows researchers in empirical software engineering to follow a systematic, disciplined approach. Second, the experiences from applying the process help avoid common pitfalls that endanger both the research process and its results. We report on two (descriptive) surveys on software reviews that applied the survey process, and we present our experiences, as well as models for survey effort and duration factors derived from these experiences.